12WK Fresh Body Fit Mind— amandabisk. SO, HOW ARE YOU GOING TO GET FIT WITH MY 12 WEEK WORKOUT PROGRAM, MOTIVATION GUIDE & ONLINE FIT COMMUNITY? I DON'T WANT MY TRAINING TO BE BORING, AND I'M SURE YOU DON'T WANT THAT EITHER! I designed this 12 week workout plan to help you reach your 2016 body goals. This is the training I do everyday to stay in shape, basically, FBFM is 3 months of my exact workouts in a super easy to follow guide. The exercises and training style in this program are scientifically designed to target fat burn, as well as build lean toned muscle. Before we go any further, I want you to know that I have trained thousands of clients and have over 12 years experience as a Qualified Exercise Physiologist, Exercise Scientist, Personal Trainer, Elite Athletics Coach, Crossfit Coach and Yoga Instructor. SEE MY WEEK ONE SCHEDULE AND DOWNLOAD DAY 1AM & PM CIRCUITS FROM THE GUIDE. 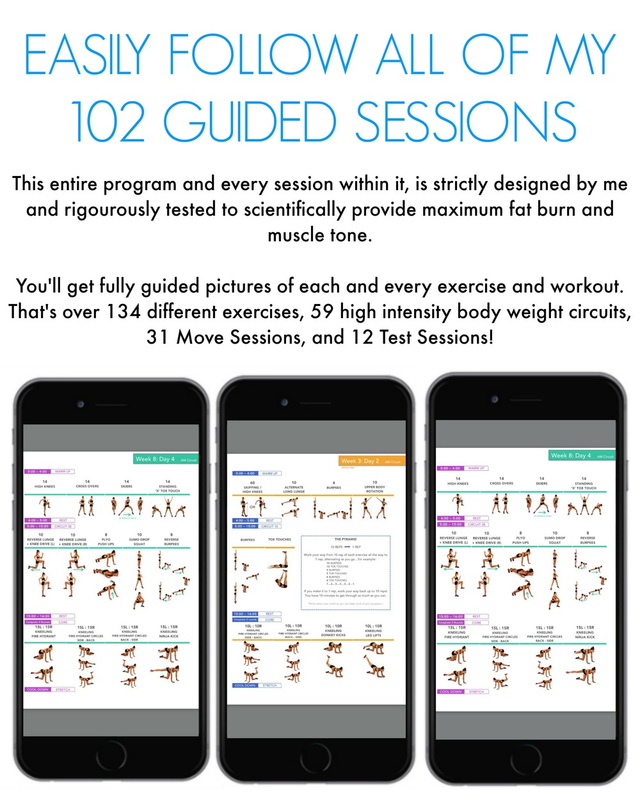 The full Fresh Body Fit Mind program is 198 pages and has 102 guided sessions in 84 days including: 12 test workouts, 34 Move Sessions, and I'll show you how to use 'My Sessions' to keep you motivated. GET TO KNOW HOW TO USE MY WORKOUTS. DOWNLOAD THE INSTRUCTION PAGE BELOW AND I'LL SHOW YOU STEP-BY-STEP! Fresh Body Fit Mind comes with a password to my Members Only Area on www.amandabisk.com where you will get video tutorials for all 134 exercises, plus all of my alternative variations. TAKE A SNEAK PEAK BEHIND THE LOGIN TO SEE YOUR MEMBERS AREA & PROGRAM CALENDAR! Another cool feature of the FBFM Members Only Area is the week by week calendar, with each week having special videos from me about staying on track, pushing through common hurdles, and exercise tips. NOT READY YET? I WANT YOU TO TEST OUT MY TRAINING STYLE FOR YOURSELF...FOR FREE. Get my 7 Day Pre-Training Program, complete with downloadable guide, follow along workout, and video tutorials. What's With The Twice A Day Training Style? High Intensity Bodyweight Training - For muscle tone and strength. Plyometric Training - For athletic shape and increased power. Cardio Training - To target fat-burn and fitness. Core and Functional Training - To shape your body, get abs, and target those underlying muscles you never knew you had. 4 days in the week, you'll do 2 x 20 min whole body workouts, broken up into one AM and one PM workout. (These can also be combined into a single 35 minute training session). Once a week you have a Test Day, where you'll face a physically and mentally challenging workout (1 x workout in the day). Designed to measure your progress week by week, and push you to your limits. Once a week you have a My Session, where you can add your favourite style of training/activity to keep you motivated and on track. Recovery Day is scheduled in on your final day in the week. I'll give you tips on what to do on this day to keep you injury free and recovering to your full potential. I Don't Have Time For Twice A Day Training? Don't Stress, In the Education Section of Fresh Body Fit Mind, I will go through how to combine my AM & PM workouts into one single 35minute Power Session. Your 12 weeks doesn't end after 12 weeks, once you buy your Fresh Body Fit Mind program, you have lifetime access to the program, the Members Area with video tutorials and live workouts, the Online Global Fit Family Group and lifetime access to any updates I make to the program. I even e-mail all the updates to you! Do i need to buy any equipment or gym memberships? A space to move, about the size of a yoga mat or standard bathroom towel. Some weeks have a workout like the one below, with an exercises using a weight (eg. overhead reverse lunge cross over). Don't worry if you don't have any equipment, there are options to substitute! 1. You don't NEED to use the weight at all, this is still a challenging exercise even without the weight! 2. Use household items to add weight, for example, a book, a backpack with a few books in it, a shoe box with some books in it, a milk bottle filled with sand, a water bottle, a couch cushion, a pillow, anything... get creative! 3. Use any type of weight that you may already have, you don't need a medicine ball if you don't have one, use anything from a sand weight, a dumb-bell, a weight plate, a kettle bell etc. How Many Workouts Are In The Program? In 84 days, you'll do 59 circuits, 31 move sessions, 12 Test sessions, and 12 My Sessions. That's 114 workouts! What The Purpose Of My Fresh Body Fit Mind Program? To grow muscle and burn fat using bodyweight exercises you can do anywhere, anytime. To refresh your mind and motivation on a daily basis, and challenge you to think deeper about your body and why you exercise. To keep exercise fun and interesting with a huge variety different exercises, training styles and challenge workouts. To connect people through our secret group, who love fitness, and are on a journey to inspire change in their lives. To help you reach your goals, whether you need motivation or training advice, I have made weekly videos in my FBFM Members Area to help you the best I can. What do I get when i buy fresh body fit mind? My 12 Week Workout Program & Motivation Guide: Instant access to download my fully guided 198 page 12 week workout plan & motivation guide. Save this to your computer, to your smart phone, to any device you might use, and to a USB so you won't lose it. Members Area Password: Instant access to download your password so you can log in to the FBFM Members Area on www.amandabisk.com. This special members area is where you can access your program calendar with weekly personal videos from me, follow along workouts, exercise tutorials and lots more. Access to join the online Fit Family community: sign in to the FBFM Members area on www.amandabisk.com and request to join our secret online fit family group. An email receipt: You will receive an e mail receipt with download access to the program, this expires in 7 days so make sure you download and save your products in a safe place. Product Updates: I am always adding new things to my program and Members Area for you, you only need to buy the program once and you will have lifetime access to it, as well as any updates I make to it. where can i buy it? Available Worldwide. what currency can i pay in? Any Currency. Anytime, any day, from anywhere in the world. 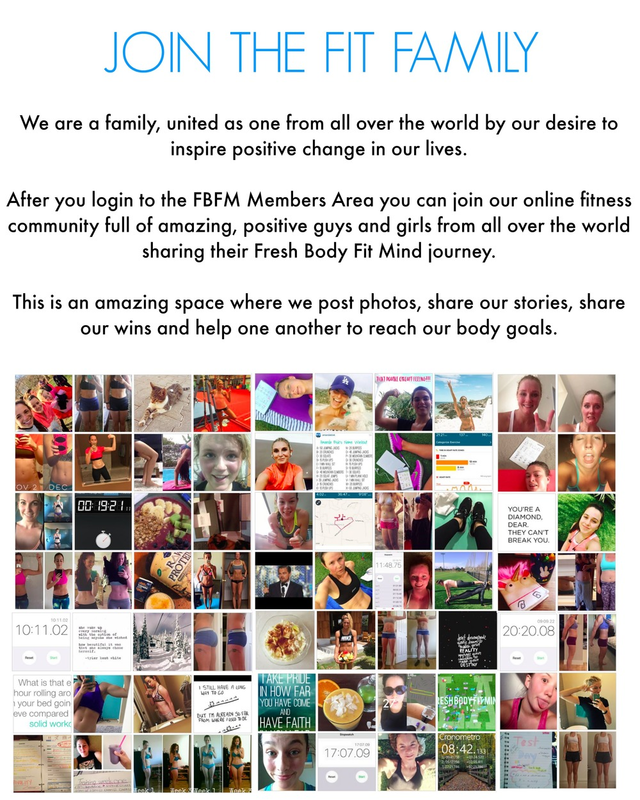 There are 1000's of members on different weeks of the program which is what makes our FBFM Members Group so exciting! We chat with each other, learn from each other and work out together to achieve amazing results! What is the fit family? The fit family is the name I've given to everyone doing my 12 week fresh body fit mind program. We are a family, united as one, from all over the world, through our love of fitness and inspiring positive change in our lives. The fit family is about having support, having a friend to motivate you, and always having someone to share your journey with. 3 Months Of My Exact Workouts In An Easy To Follow 12 Week Program.